Oh Mercy! When reading the BBC online news today, I was shocked to read that the British now believe there’ve been as many as 14 other enemies of the Russian State that were murdered in such fashions so to appear having been accidental or natural cause deaths. Hopefully after all those files have been re-examined, the people in Great Britain and the rest of the free world with wake up and smell the coffee because the far-reaching powers of the Kremlin have cohort tentacles of an octopus reaching deep into the sovereign lands of countries around our globe. It’s appears worse than what one would see in a James Bond movie. I mentioned to several pillars of our community today how I believe all the more people in power around the world have souls or consciences that are as black as coal. For innocent people to be murdered simply because they don’t share the same political and or religious beliefs as those in power, is telling us we’ve got some gravely serious problems within the governments of those all those noticeably more heavily militarized countries. When law-abiding citizens finally cut fear out of their lives, their perceptions of the world around them is so greatly changed, that it’s as if they’d been living their lives as characters out of old black and white movie, and then suddenly enveloped with all the textures and nuances of color. Now just think about how many people you know live in black and white worlds. Certainly you’ve come in contact with those who’re convinced that if you’re not with them, you’re against them. Or what about those who believe some idea or way of life is either right or wrong? Whatever happened to those middles, or should I say, “gray areas”? Someone said something to me today that actually shocked me. We were talking about all this craziness that’s been happening recently in our world, and suddenly she stopped and said, “Well you know these times have been foretold in Scripture.” After swallowing hard and collecting my thoughts after her interjection, I said, “We don’t have to appear as though we’re encouraging it by remaining silent.” That was the end of our conversation. 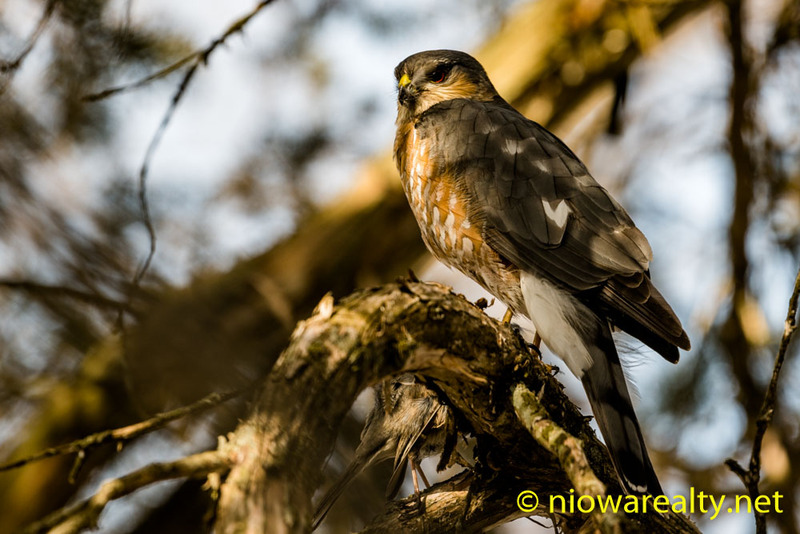 Believe it or not, I managed to get a shot today of a Cooper hawk in a tree which I’ve posted tonight. Someone mentioned today that our government is becoming all the more hawkish with these new appointments along with the revelations regarding those murders in Great Britain. Quite the coincidence don’t you think?